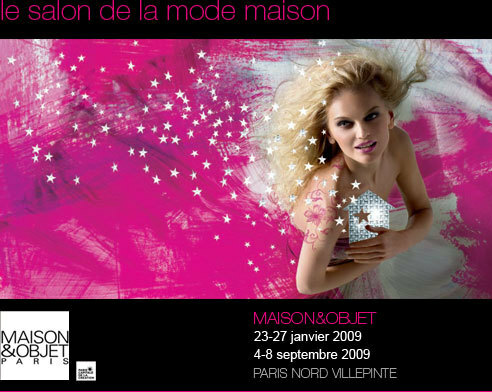 There will be a lot of blogging on this, the European trade market on home fashion and decor.in Paris, France, MAISON & OBJECT. Some will be from designers whose primary interests differ from mine. So as to not be redundant, Beadboard will focus on how what I see presented at this huge market translates into your world and home. 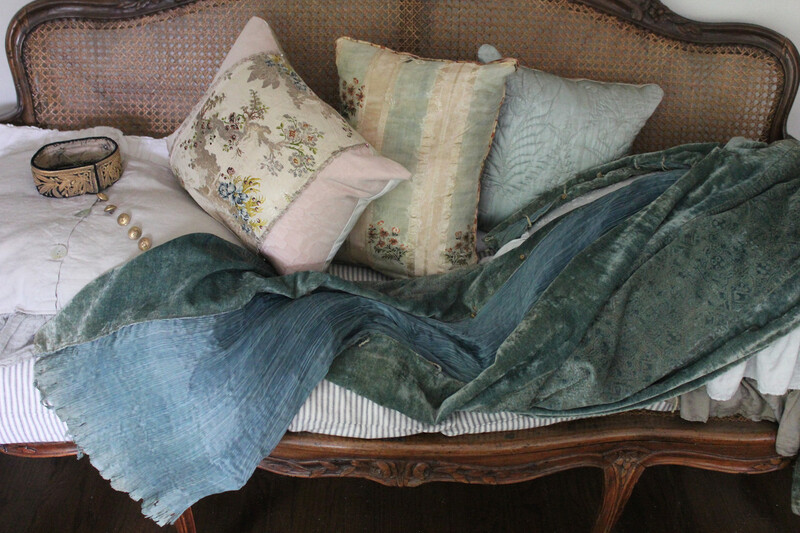 As a design shopgirl,my considerations trickle down to my customers/readers. Will they "Get" a certain look? 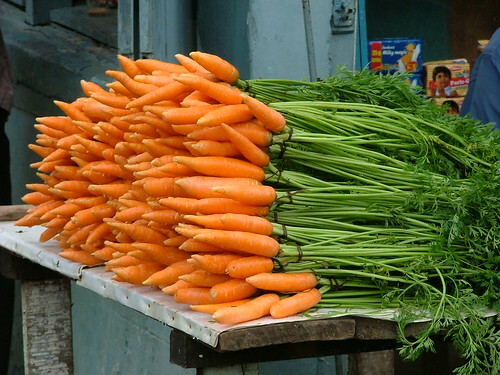 Is it duplicated in the US? Is is saleable, the quality there, a good value? Will the look be here down the road a few years? Is it comfortable livable and WOW??? WILL I RUN INTO GERARD DEPARDIEU AT THE SAME RESTAURANT I DID LAST YEAR??!! Monsieur Depardieu at a restaurant in the Marais that we frequent, last year. That being said, we are still in Paris gathering info for you and will be back soon..
Oh where, oh where, has my Metro ticket gone??? Oh where oh where can it be??? ?I checked all my pockets and the little stinking thing was gone. When you travel on the Metro in Paris, (in this case the RER) we buy two tickets one out and one to retournee. Each has to be entered in a turnstyle to let you board the train and when you arrive you have to reenter the ticket so that you can leave the station. There are some people who "cheat" and jump the turnstyles to not pay the fare. NOW, it seems, I am one of those criminals.!!!!! I however, did not cheat I bought the ticket and lost the stupid thing. ,So ,in front of everyone at Maison et Object in Paris I crawled on my knees in my vintage cashmere coat (much to Robespierre's amusement) under the turnstyle to get the hell out of the metro before I went to meet Greet, Amanda ,Tracey and Haley. (They don't know what a moron I was.) Robespierre was only sorry he couldn't get a picture of me doing it and actually asked me if i could do it again tomorrow!!!!! (NO, I DON'T THINK SO.) See how small this little ticket is??? When I crawled out of the turnstyle at our destination, (I had to do it twice) there was this tall young man who looked like Michael Phelps who saw me on all fours and actually winked at me like I was ONE OF THEM as he leaped over the turnstyle to board the train!!!! Tune in Sat night for my television debut on the ever popular Paris's most wanted! 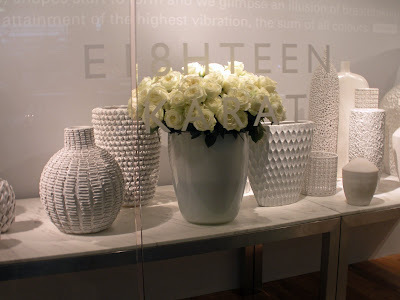 Canadian designer Maureen Whelton really hit the mark with this fresh white spring collection. 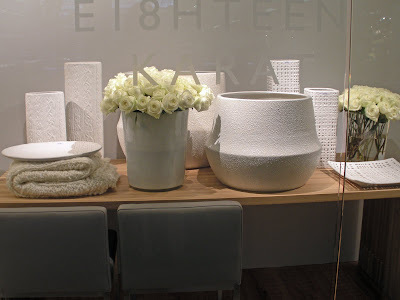 The white textured ceramic pieces mixed with opalescent glass in pale blues are crisp and beautiful. 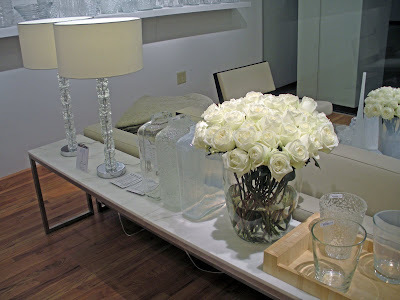 The showroom was accented with white roses everywhere. 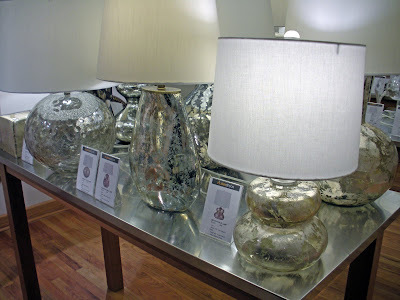 For the first time this season they are adding offerings of Mirrors and table/floor lamps from another Canadian company. 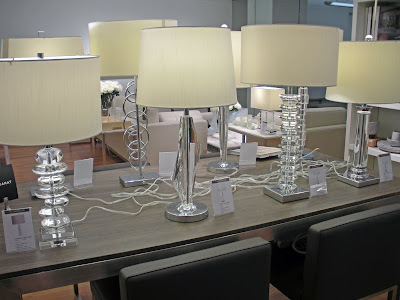 The lamps mix well with existing product and they are not acrylic. 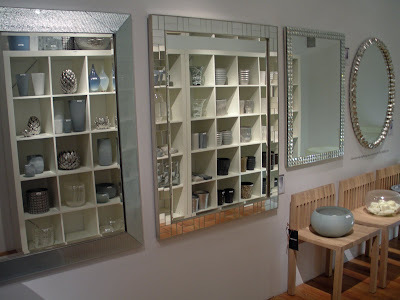 They are glass and crystal at remarkably affordable price points. 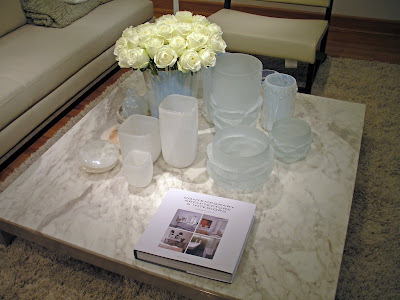 One of the marble and steel coffee tables with the frosted vases surrounded with a 1/2 " mini ruffle out of the glass....How cool is that? These are gorgeous. The one on the left is the "River Rock" lamp and it looks just like crystal river rocks stacked up. Stunning! 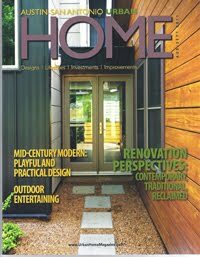 We carry this line at Beadboard. Even though our shop is more Euro Country, people appreciate the artistry and texture of 18 Karat, and the collection changes every six months so there is always something new. 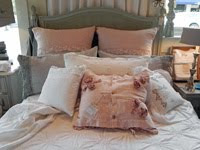 A blog note: I just discovered "The Provence Post" Julie Mautner is an experienced free lance magazine writer who lives in the South of France she is refreshingly entertaining. Check it out!!! Recently an actress I love came out with her long awaited memoir. The actress/ dancer/chanteuse is the lovely Leslie Caron who at 78 still can wow. relationships with people like Warren Beatty. Evidently, they had great fun together. Classically trained as a ballet dancer made her sought after in Hollywood and she landed the role of a lifetime dancing with Gene Kelly in American in Paris. 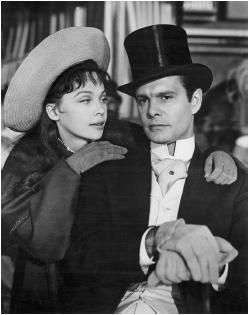 My favorite, "Gigi "with Louis Jordan as she grows up in Paris and is trained as a courtesan and then shocks her family by saying she will not be one, instead she wished to marry. And marry she did. It is from this film that the title of the book was inspired, when Maurice Chevalier sang "Thank heaven for little girls"about the young Gigi. 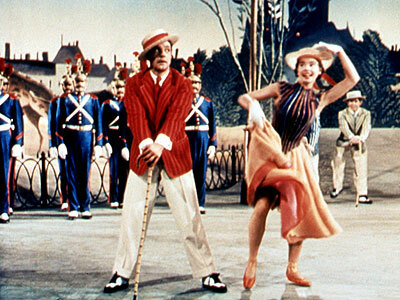 Dancing with Gene Kelly in "An American in Paris" showed the world her versitility as a film star. The book is available on Amazon. Every time I see this amazing piece of architecture it takes my breath away. What is equally amazing is the prospect of meeting other bloggers, designers, authors and people of this genre here. Jackie Von Tobel and I are organizing a meet and greet in this awesome city and would love it if you are so inclined to join us in Le Marais, in the 4th Arrondisement, Paris, France, during Maison et Object. in a fabulous new Hotel in the 4th to be revealed......( we still are determining how many of you are coming, and it will be FUN!) Email me at beadboardupcountry@sbcglobal.net if you would like to join us. A Bientot! There is no question that the success of Beadboard has been through a lot of hard work and making ourselves available to our fabulous customers sometimes on a 24/7 basis. At lot of people ask us what motivates us from October, when things start hopping out here, through the holiday season. We didn't know if we could afford to go this year, but the shop Gods were kind to us and we are going. The problem was how could we get a great place at this late date????? We are avid cooks and last time a microwave-roasted Bresse chicken didn't quite cut the mustard...And, could we get plane reservations on a nonstop flight? We asked our readers if they knew of someone that had an apartment for lease and can you believe it????????? We got several responses all worth checking out. We will show more of the lovely "Apartement La Carotte"
but thanks to a reader named Jenny we will be cooking some dinners in THIS kitchen. We would like to offer our heartfelt thanks to her and others for responding to us. City of Lights, sharing our experiences, great restaurants and shopping, along with websites you can access that are of extraordinary help.